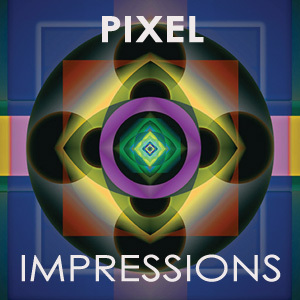 Arts Visalia is proud to present Pixel Impressions, an exhibition of digital art by six Central California artists. Featuring works by Joan Constable, Elsah Cort, Robert Mertens, Brent Mosley, Wayman Stairs and Susan Thompson, this exhibition highlights the diversity of approaches to digital media each of these artists employ in their creative output. While Photoshop has long been the standard software utilized by digital artists over the past twenty years, the past few years have brought major new opportunities for creative output as digital cameras have improved and as software developers have produced a steady stream of new applications. In fact, three of the artists included in the exhibition, Brent Mosley, Wayman Stairs and Susan Thompson, work exclusively with Iphone and Ipad applications. Thompson, who stands among the first generation of exhibiting Photoshop artists, produces work most directly related to traditional photography. Mosley and Stairs produce work of a distinctly surrealistic bent. It is safe to say, however, that in viewing the quality of the the work each of them present in this exhibition, it is almost unbelievalbe to think that it was was created entirely on a phone. Mertens brings his experience in the arena of commercial textile design into the production of his personal work wherein he uses digital cameras, photoshop, scanners and other digital tools to create images which blend elements of photography, collage, painting, and design. Similarly, Elsah Cort, approaches the digital image with a collage sensibility. Her works impart a sense of richness of history and narrative bound up in the complex layers of visual material. Playful and experimental, Joan Constable also brings a photographic background combined with a collage aesthetic to her works. The exhibition will be on display from September 30 through October 30 with an opening reception to be held on Friday, October 2nd from 6 to 8 pm. Arts Visalia is located at 214 East Oak Avenue in downtown, Visalia and is open the public Wednesday through Saturday from noon to 5:30 pm.